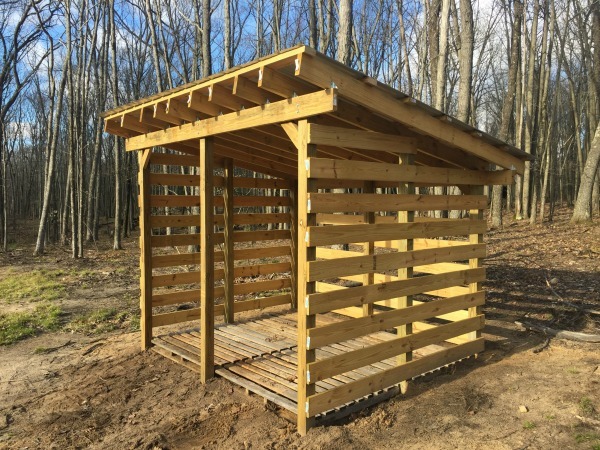 A firewood storage shed is a structure used to hold firewood and protect it from the weather, allowing it to season and stay dry. Whether you bought your firewood or cut it yourself, protect your investment by storing your firewood in a shed or other shelter. A storage shed can come in many different styles and sizes. While the shed plans can vary in design, they should all have the same basic concept. Generally constructed of a roof and three sides, a shed can protect your firewood and keep it ready for use. Keeping your firewood off the ground will prevent moisture from soaking into the bottom row of wood. It will also help prevent insects from contaminating your wood stack. If your shed has a cement floor, it may not be necessary to stack it off the ground. I have two lean-to structures on each side of my barn. One has a cement floor the other is dirt. On the cement floor, I never place any kind of 2x4 runner down to prevent contact with the cement. The dirt floor lean-to is different. I always stack wood on a barrier. What are the results? I have never have a problem stacking my wood directly on the cement and both lean-to's keep my wood dry and ready for use. Old pallets also make a good ground barrier to stack your wood on. They keep it away from the wet ground and allow air to flow under the wood, keeping it dry. Having a roof over your shed will keep the rain and snow from ruining your supply of wood. Constant rain and snow could reduce the quality of the top layers of your wood stack. Just think, if you always grab firewood from the top layer and that layer is always getting rained on, then you're always grabbing wet wood! If you have ever tried to start a fire with wet wood you know it can be very frustrating and time consuming. A roof over the firewood is very convenient because it's permanent and unlike a tarp or cover, you never have to worry about taking it off and putting it back on. The roof should be slanted to allow water to run off. 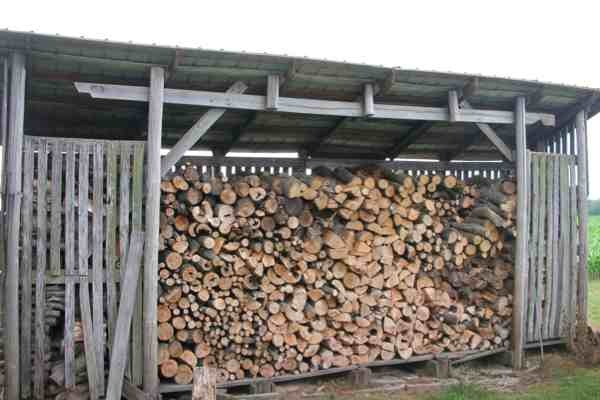 Have the roof overhang the wood pile on all sides to offer protection and prevent water from dripping on your firewood. Most firewood sheds have three sides and leave the front open for easy access and proper air flow. It's important not to seal off the firewood on all sides because air flow is important to keeping the wood dry or allowing it to season. The sides do not have to be constructed of a solid material. Slatted sides with 2-4 inches between the pieces of wood will allow wind to penetrate the wood stack while still offering protection from the weather. Storing your firewood in a shed is not something that you have to do, but it is convenient. A shed offers great protection and allows you to effectively store firewood for long periods of time without the risk of inclement weather damaging your firewood. Look around...You will be surprised what you might find laying around to use a building material for a shed. If you use a firewood storage shed your firewood should stay dry and create a nice, warm, hassle free fire.